– 2 x AAA batteries (INCLUDED) – Flashes by music & any sound, controllable sensitivity adjustment – Comfortable with padded fit, 1 size fits most Preview Ready to ship in 1–3 business days. Light up mask aka LED Mask is one of the coolest accessories you can use. Light up mask is the must have product if you like parties and raves! We have different kind of light up masks; from scary to funny! 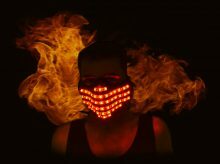 Browse our LED mask category and enjoy your mask shopping for the party or fun events! Don’t forget to check out BIONIC LED MASK as well. LED mask usually works with 1 or 2 small batteries that come with it. Many masks have different patterns and different motion activities. Sound activated light up masks are pretty popular at rave parties. They usually made with adjustable straps so they fit to every face easily and comfortably. Make sure that your mask is waterproof if you will use it near the pool or ocean. Most of them are not waterproof but water resistant.